Somark Innovations announced bio-compatible RFID ink, which can be used to tattoo cattle and laboratory rats and can be read through animal hair. This is a passive RFID technology that contains no metals; the tattoos themselves can be colored or invisible. The Somark ID System creates a "bio-compatible ink tattoo with chipless RFID functionality." The RFID ink tattoo does not require line of sight to be read, as is the case with other RFID devices (making them better than a barcode for some applications). RFID ink tattoos also solve the annoying problem of ear tag retention. 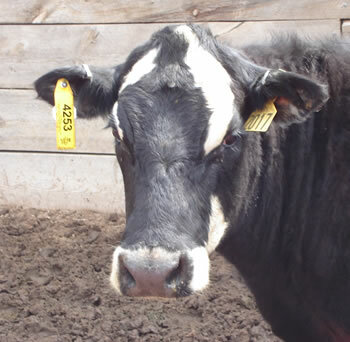 Conventional RFID ear tags sell for about $2.25; about 60-90% of them eventually fall off. Also, Somark claims that the bio-compatible RFID ink system will improve readability rates as well. Somark Innovations co-founder Mark Pydynowski noted that the RFID ink is fully biocompatible and was safe for use in humans. He noted that RFID ink tattoos could be used to track and rescue soldiers. He remarked "It could help identify friends or foes, prevent friendly fire, and help save soldiers' lives." Readers should note that VeriChip tags for patients are FDA approved and VeriChip tags have been proposed for immigrants. This technology reminds me of Jack Vance's spray-on conductive wire; it also makes you think about the other possibilities that having an ink that can be used to create a functioning circuit. You don't need to tattoo it; you could print it onto flexible surfaces, like the sleeve watch from the 1981 novel Dream Park. Maybe now they can get that Dattoos skin circuit idea off the ground. Story Invisible RFID Ink Safe For Cattle And People (no word yet on how safe it is for democratic traditions) via VCTB.